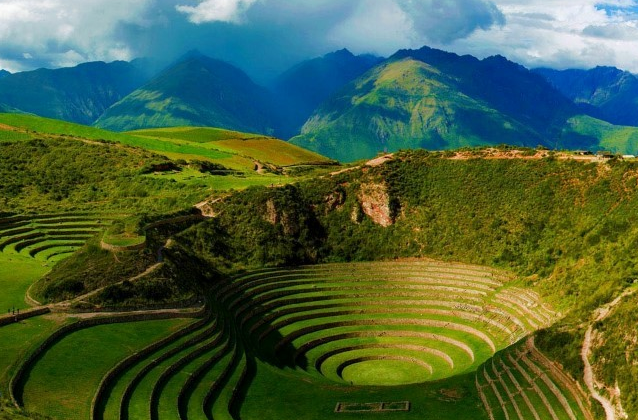 This is a fantastic half day tour to explore three popular tourist attractions of the sacred valley: The salt pools of Maras, the inca terraces of Moray and a quick stop at Chincheros. You will be picked up from your hotel as long as it is in the Historic center in Cusco at 8:00am (08h00) and you will travel through the Sacred Valley of the Incas until you arrive to Chinchero. We will make a quick stop at an artesan center and view some inca ruins from the distance. From here, we will descend to the Village of Maras and visit the Maras Salt Pools to discover how the Incas ingeniously tapped a natural salt water stream to create evaporating pools for collecting salt, a system that is still used to this day. Then we will continue to the ruins of Moray, a site of circular terraces, some as deep as 98 feet (30 meters), that once offered a testing ground for agricultural products. Each terrace has a unique microclimate which subsequently experiences its own temperature. Without even having to leave the valley, the Inca had created an agricultural laboratory which mimicked the temperature throughout the empire. After your tour, you will be dropped off at the Cusco historic center.This tour also gives you amazing views of Urubamba mountain range with stunning views of the Veronica mountain and the green farming valleys. On this tour you will learn about agriculture , textiles, and the history of the incas. Entrance tickets to Moray not included because some travelers may have already purchased the 10-day Tourist Ticket for S/. 130 PEN ($45 usd) which covers entrances to Moray. Or you can purchase the 1-day entrance ticket for S/.70 PEN ($25 usd). • Money for tips, souvenirs, etc. The Maras Salt Pools + Moray terraces tour is rated EASY. However, it is important to feel comfortable walking for extended periods of time 20 minutes at a time approximately. The Maras Salt Pools + Moray inca terraces tour departs daily and it is available year round. The months of January, February and March are in the wet season, please bring a good rain jacket and waterproof your belongings.